Having operated Family Entertainment Centers for over 30 years, Off The Wall operates 2 locations with massive indoor trampoline courts where bouncing off the walls is a good thing! Dodgeball, Slamdunk, Music, Laser Tag, Obstacle Ropes Course, Rock Wall, Virtual Reality Games, Arcade Games, full menu restaurant, TVs and free WIFI, and their new Crazy Cars Ride! A whole new way to experience fun and fitness for all ages. 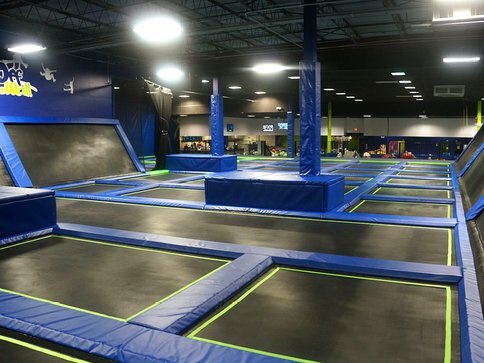 Off The Wall, looking to improve the conditions of their two locations, increase efficiency and quality approached ONPEAK Energy to assess and determine energy savings opportunities first at Coconut Creek Trampoline Center and after the Davie facility to find a solution in the lighting area that could add value to the organization. ONPEAK Energy, a Florida-based Efficiency Consultancy Company that works with energy saving solutions, designed an LED lighting system that allowed Off The Wall to save money and improve quality and light levels across their two locations. ONPEAK was able to create a customized solution that had no negative cash flow impact and allowed Off The Wall to get this project done without impacting their budget; all the investment was paid back by savings and rebates generated with the new and more efficient lighting system. ONPEAK worked together with its pool of providers to come up with a solution that met both operational and technical requirements and also took into account all incentives and financial benefits. We visited the client´s location, performed analysis based on information provided by the staff and interviews with the management to run different scenarios. Based on all the inputs and the desired results ONPEAK selected an LED retrofit solution that could achieve an ROI of 1 year (including abandonment and EPAct), and improve the quality of lighting significantly. For location number 2 we proposed a solution improve the light in all areas uniformly, consider light produced by the arcade, different heights in the premises and a dimming system, all in compliance with technical and operational requirements with the objective to reduce energy consumption, reduce maintenance cost and provide a better quality of lighting. A total of 644 fixtures were retrofitted between the 2 locations, including high bay lights, can lights, troffers, and LED tubes. With ONPEAK’s solution, Off The Wall was able to update their lighting system to an LED power efficient system, improving their lighting levels up 70% between both locations. The project created annual savings of $47,815.00 in energy and maintenance. The new lighting levels improved the the looks and the lighting condition. For Off The Wall this was a risk-free project since no up-front payment was required, savings were measured, and equipment and labor is being paid with the generated savings.